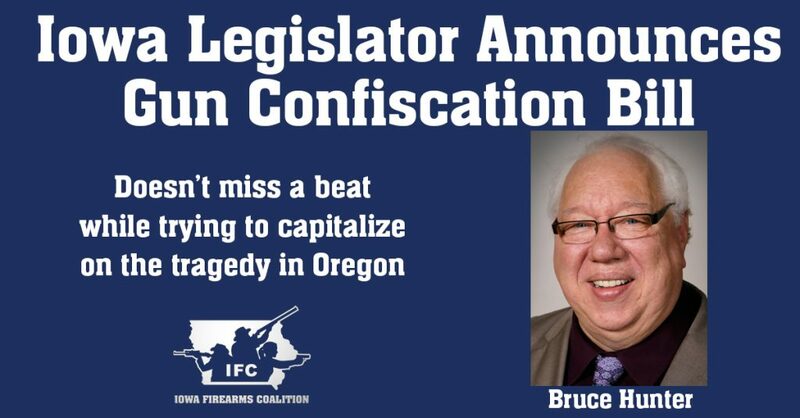 Representative Bruce Hunter wants to start confiscating Iowan’s guns. This should come as no surprise, but an Iowa legislator is already to trying to capitalize on the dead and wounded from the tragedy in Oregon. Des Moines Democrat Bruce Hunter announced Monday that he plans to introduce more gun control legislation once the 2016 legislative session begins in Iowa. Hunter told WHO-TV that he wants to pass a gun confiscation law, as well as universal background checks in Iowa. Unfortunately the fact that Representative Hunter seems to have missed is that Oregon’s universal background check system failed to stop that murderous rampage at Umpqua Community College. Nor would they have stopped the on-air murders of Alison Parker and Adam Ward in Roanoke, Virginia. Or the Charleston, South Carolina church shooting, and so on and so on. Time and time again we see these tragically unfortunate incidents and time and time again we learn after the fact that universal background checks would not have stopped the killing. Despite all that gun control zealots like Representative Bruce Hunter refuse to acknowledge that their grand scheme is a non-starter. The push for gun control in Iowa is nothing new for Hunter. Last year he introduced a trio of bills that would have banned the sale, trade, or transfer of all semi-automatic firearms. He also peddled a bill that would limit magazine capacity to just 10 rounds. And of course he tried unsuccessfully to institute universal background checks. Fortunately the Iowa Firearms Coalition and our allies were able to stop these bills in their tracks. Hunter’s latest gun control push comes as no surprise. He’s been pushing gun control bills for years and has the language all queued up and ready to be introduced as soon as the legislative session begins. What’s disturbing however is the fact that Representative Hunter has no problem trotting out his plans in the aftermath of a horrible tragedy, yet months before the legislative session begins. It’s no coincidence that Hunter is rolling out this gun control package in the days that follow an unfortunate loss of life. In the words of the rabid gun control advocate Rham Emanuel, “Never let a serious crisis go to waste.” Sadly, Representative Bruce Hunter has taken that message to heart and is using innocent lives to advance his personal agenda. Why thank you Bruce! You’re only going to infringe on our rights a little at a time, how very generous of you! We also appreciate you broadcasting your true intentions rather than hiding real goals like so many of your fellow gun control advocates like to do. The Iowa Firearms Coalition will be in the capitol building on day one of the 2016 legislative session, and every day there after. We’ll be taking Representative Hunter and his gun confiscation plans head on. If you’re like us and want to see our Second Amendment rights protected and enhanced we invite you to join the IFC. It’s the best way to send a strong message to gun control zealots that their infringements won’t fly here in Iowa. Another week in the legislature is complete. We’re continuing to see progress on pro-gun owner rights bills but we’re starting to see anti-gun opposition taking form and lining up against our bills. We need your help to overcome these anti-gunners. More details below on how to do your part. As you know we’re closely tracking gun legislation in the House and Senate. Right now four IFC backed bills are making their way through the legislature, but there are a number of groups who are actively fighting against our hard work, and trying to stop these pro-freedom bills from passing. Here’s a brief recap of who’s lobbying againstfirearms bills that would protect and enhance the Second Amendment rights of Iowans. Our desire to protect and enhance our Second Amendment rights faces plenty of adversaries. We’ve made solid traction so far, but we’ll need some serious help from here on out if we want to see these bills, or any others signed into law. To make it as easy as possible for you we’ve just updated our Legislative Action Centerto include a brand new ‘Advocacy Campaign.’ This is a pre-written email that goes directly to the people that are supposed to be representing your interests in the capitol. The our latest advocacy campaign urges lawmakers to vote “Yes” on pro-gun owner bills. A wave of support from Iowa’s firearms community is needed to make sure our lawmakers know Iowan’s true feelings on Second Amendment issues. Hit our newest legislator email, tell your lawmakers you want to see pro-gun owner bills signed into law this year. And just as importantly, get your family and friends involved. We face mounting opposition, and it’ll take continuous support from people like you if we want advance our cause in the legislature this year. Expect to see more updates as pro-gun owner bills work through the legislative session. Last week saw the introduction of two very solid bills. Representative Greg Heartsill is sponsoring a bill to remove the arbitrary minimum age requirement to handle handguns in Iowa. Heartsill’s also sponsoring a bill that would make Iowa a Stand Your Ground state by removing your duty to retreat from an attacker. In addition to Rep. Heartsill’s bills we’ve also received some very good news from Representative Chip Baltimore that anti-gun bills will not be gaining any traction in the House this year. Remember you can stay up to date on all firearms bills at the IFC 2015 Legislative Session page. There you can find bill numbers, who sponsored them, the bill’s status, and a brief synopsis. Last week Represenative Heartsill introduced the following bills that both protect and enhance Iowans rights. Currently anyone under the age of 14 is strictly prohibited from holding or shooting a handgun in Iowa — regardless of whether or not that minor is under parental supervision. HF99 would amend the state code to allow a person under 14 to lawfully shoot a handgun, with proper supervision, as long as their parent, guardian, or spouse who is 21 years of age or older has provided consent. This legislation would remove a person’s “duty to retreat” from an attacker. This would allow law-abiding citizens to protect themselves or their family anywhere they are lawfully present. This legislation would also expressly enhance the protections against criminal prosecution and civil lawsuits when justifiable force is used. HF45 – Emergency Powers & HF59 – Preemption Cleanup have both been assigned to subcommittees in the House Judiciary Committee. We’ll be updating any changes to their status on our 2015 Legislative Session page. A week ago we told you about a trio of gun control bills introduced by Representative Bruce Hunter. At the time we knew the bills had very little chance of passage, and now we’re even more confident. That’s because Representative Chip Baltimore, Chairman of the House Judiciary Committee, has stepped up and made it very clear that he opposes these anti-gun bills and will not be considering them in his committee. This is a significant development and Representative Baltimore deserves many thanks for taking a stand. Please take a moment to contact Representative Chip Baltimore and say thanks for standing up for Iowan’s Second Amendment rights. Tell him thanks for opposing gun control efforts and standing up for our rights. Brush up on the latest on Second Amendment bills introduced this session. Tell them you’re a Second Amendment supporter and there are thousands more like you who expect them to protect and enhance our Second Amendment rights. Not sure what to say? The IFC has pre-written emails that go directly to your legislators -OR- read up on IFC Board Chairman John Reed’s tips on how to maximize your communications with lawmakers. ​Forward this email to family, friends, or anyone who values their rights. Follow us Facebook & Twitter. ​Join Iowa’s most effective firearms advocacy group. Iowa Firearms Coalition is an entirely volunteer, grassroots, 2nd Amendment advocacy group. Responsible for bringing uniformity to Iowa’s Concealed Weapons Permitting process, IFC’s members work to protect and enhance 2nd Amendment rights in Iowa. An affiliate of the National Rifle Association, the IFC actively seeks to foster and promote the shooting sports. Sign up for our email list for the latest on 2nd Amendment issues in Iowa. 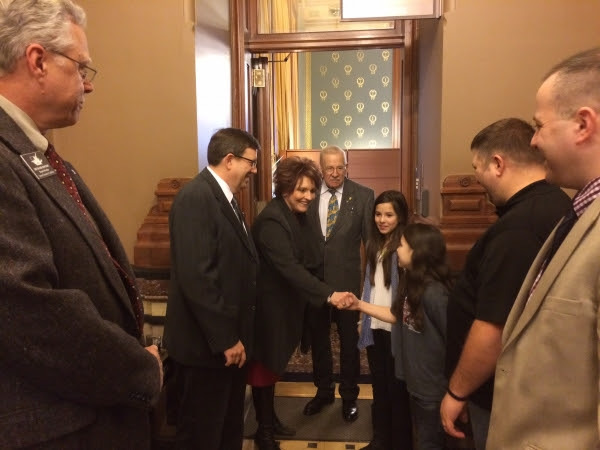 Legislative ALERT — Anti-Gun Bills Introduced in Iowa Legislature. Passage Highly Unlikely. Anti-gun organizations have once again submitted their usual rights-restrictive bills in the House, but key legislators have indicated that these bills will not be advancing out of the House and probably won’t even make it through committee. You may hear other gun groups squawking about the sky falling and needing your money to stop it from happening. DO NOT BE FOOLED, these anti-gun bills WILL NOT be passing. Instead we encourage you to save that money to spend on fun stuff, like ammunition, training or a NFA tax stamp for the suppressors that will soon be legal in Iowa! In the meantime, the Iowa Firearms Coalition has been working closely with leaders and legislators in both chambers and are close to achieving the final language of a bill to be filed in the Senate and the House very soon. While we can’t reveal the bill right now since negotiations are still ongoing, we are comfortable saying that once it’s passed, gun owners across Iowa will be very pleased. (From left to right) Richard Rodgers, Iowa Firearms Coalition Board Member; Kraig Paulsen, Speaker of the House; Linda Upmeyer, House Majority Leader; Clel Baudler, R. House Member; Gibson girls with their father, Nathan Gibson; and Barry Snell, Iowa Firearms Coalition President meet to discuss removing the age limit for children to fire handguns with proper supervision and parental permission. So stay tuned! When key members agree to run the bill, we will send it to you too and create an action center alert so you can continue to show your support and contribute to the passing of this historic bill.